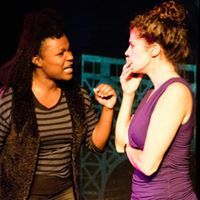 Carnival Girls Productions is currently presenting The Werewolf of Washington Heights by Christie Perfetti Williams at The Kraine. Charmaine Broad directs. If you are familiar with the playwright’s work, such as An Appeal To The Woman Of The House, which gained a 2014 NY Innovative Theatre Award, you might be expecting a new slant on civil rights, with strong female characters. Joy: the new, intriguing play features an all-female cast (even the dance of the werewolves is all-female, as are the empowering quotes from Isadora Duncan and Martha Graham) who are struggling to overcome the many challenges to women and other persecuted groups in the somewhat grim year 2020 C.E. It is New York City just three years from now, with the skyscrapers and the big election looming. You might not recognize the place (realtors now refer to “Washington Heights” as “Hudson Heights”…“because, you know, white people”). It’s a world where the public libraries have been closed. There are no more independent theaters, public broadcasting, Pulitzer prizes or non-state journalism. The Patriot Mandate (PAT) ensures the public may only access government-approved information. Said government is at war, as usual. Immigrants have chip implants and, if they have a criminal record, a visible red tattoo with their PAT number. The main characters muse “who wants to be Jewish these days.” The polarization between good and bad is keenly felt, but teenage Maggie Tressider (Pilar Gonzalez), who was born shortly after the September 11th, 2001 attacks, notes that she finds non-committal (“beige”) people kind of boring. Maggie and her twin sister Mary live with their surgeon mother, Isadora/Izzy (Galit Sperling) and Izzy’s Dominican wife Violet Corona (Stephanie Arnette Johnson) and their aged matriarch, Imogene Tressider (Rosina Fernhof). Life for the twin girls started with Maggie winding the umbilical cord around Mary in the womb, then a hasty surgical intervention. It’s what Maggie refers to as a Greek tragedy, and, if you choose to see the sisters as the archetypical Virgin/Magdalene pair, then you might expect them to fulfill such destinies. However, one recent night both sisters stayed out past curfew and only Maggie was found. This unusual occurrence for the “perfect” Mary threatens to add even more destabilization to her whole family. Aunt Trudy Tressider (Melanie Ryan) from New Jersey starts a GoFundMe campaign but can barely keep track of which color ribbon to wear in support of which type of social ill. And then a pair of journalists come to interview everyone who knew Mary. Delia Bumbah (Lori Funk) and Iranian-American camerawoman Amira Kilo (Sheila Joon Ostdazim) have their hands full listening to Maggie, Izzy, Violet, Imogene and their neighbor Junie Dorsey (Arlene A. McGruder). Maggie is bipolar, or acts accordingly, and can track women by the smell of menstruation. Violet, who came to the USA illegally twenty years ago, has chosen to stay and be surveilled rather than being deported or fighting in the current war. Junie’s daughter disappeared a few years ago, but Junie alleges that her daughter’s skin color and illegal behavior made her someone the police did not feel obligated to look for. The family speculates as to how women can stay safe in this world, to which Imogene, who believes everyone thinks she’s crazy but is determined to add this to the list of things she has survived, replies: “Well, that’s why we travel in packs. Like wolves. Don’t believe for a second that women don’t take care of other women. Our species wouldn’t have survived without shared breasts for suckling and midwives for birthing.” This is definitely one of the more coherent things Imogene says. Imogene also implies that there are male werewolves prowling about, those who watch Fox News and give in to xenophobia and misogyny. But whose version of the story can we trust? Did Mary get involved with an anti-government group named after the Biblical Ephesians 6:12? Is Violet having an affair? Will the interview yield enough useful information? After the play ended, and I pulled my jaw back up off the floor, I resolved not to tell anyone who hasn’t seen the show what transpired. I can, however, offer an inscrutable riddle. If a young woman is prone to rebel against her mother, and she has two very different mothers, amidst a deteriorating society, what might she be likely to do next?